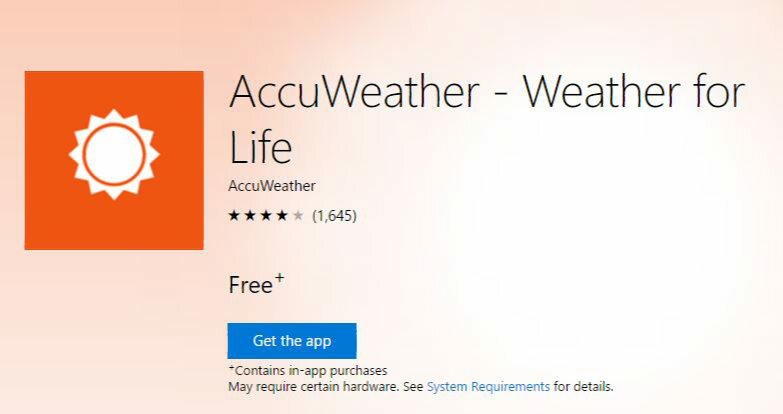 AccuWeather app is now released on Xbox One and HoloLens. The AccuWeather app included a refreshed interface, multiple Live Tiles on the Start menu, and Cortana voice interactions. Current weather conditions update every 15 minutes with the very latest humidity percentages, visibility, UV index, wind speed, direction and wind gusts, and RealFeel®. Fully interactive, full-screen Bing Maps overlaid with AccuWeather’s precise weather data. The weather app was launched for Windows 10 devices in December 2015. The UWP app is now available for Windows 10 PCs, Windows 10 Mobile, HoloLens and the Xbox One.